Dave's beginning was not what it would seem. In the beginning, Dave was famous for puking. At first, he would puke before he left the chocks, he got further each flight; but he never ever gave up. When it first got out, the boys thought it was funny, a puking Flight Surgeon. Most people thought he would soon give up. Not Dave. They saw the force of his mind make his body follow its will. In his whole life, Dave has never, ever quit. Some people would say he did not know the meaning of the word. That is not true, Hap once asked him the meaning of the word. He knew, he just does not believe it applies to him. Never underestimate Dave. NEVER. He is bulletproof. Dave could and would fly any mission, anywhere anytime. No matter what Hap did, Dave was there and Code One. Dave was one of our finest WSOs. If Dave says he is going to do something, mark it done. He is a great fellow. There is no one like him. Friends, Family, Romans, Countrymen, etc. I'm trying to get you up to date on what has become known as the almost retired last gasp of the aging warrior; to whit, the 90 day deployment of myself to Afghanistan with the Joint Center for Operational Analysis (JCOA). Further intel can be retrieved from my wife who, despite the distance, I am able to call and email on a regular basis without bankruptcy. Location: Bagram Air Field was the largest Russian military air base during the occupation. It sits in a valley about 50 km NE of Kabul surrounded by mountains now covered with snow. At 4500 feet, it resembles Denver or Boise. About 6000 personnel on base; 1000 USAF, 300 contractors, 400 USN, rest US Army. It is an armed camp with strict security in/out and resembles a Wild West town. Everybody here is required to either be in uniform or PT clothes and must carry their weapon with them at all times (except when doing PT). So we have troops just out of high school (and looking so) carrying M-16s, M-60s, grenade launchers, etc. Fortunately ROE state no rounds in chambers, so with the exception of feeling nervous when the barrel swings your way in the chow hall when being unslung, there is little danger of being shot. Weather was cold wet rainy with mud the 1st two days here; now clear skies and up to 65 degrees F each day. Numerous sweeps with troops outside of the wire, Humvees with turrets driving around, 3 dining halls, 3 gyms, runway, AC-130s for special ops, Blackhawks for transport and Medevac, A-10s for CAS; all gives the appearance of a base at war, but no Taliban seen. Also saluting rules in effect and while not many colonels and generals here, there are many junior officers and enlisted so on a routine walk to lunch, I may end up saluting 50-70 times. Right arm very tired at the end of the day. Kabul: Afghanistan is semi recovering from about 30 years of war; 1st the Russian occupation then the war between the warlords ending in the Taliban rule, then the US invasion and Taliban overthrow starting in 2003. Much rubble in Kabul since a lot of the fighting during the latter stages took place there. We traveled in an armed convoy of 3 up armoured SUVs, radio contact over the Kabul-Bagram road. Significant poverty, worse than Honduras or Vietnam but children do not look malnourished. Truly a 3rd world country with diesel fumes, crowded streets, vendors, potholes, etc. The embassy and NATO HQ is located in a former upscale residential area that has been blocked off and guarded by Afghan army, US contractor security and US Army with much ID checking, vehicle checks, etc. I am spending intro time at Bagram, but much of my work (defining civil-military interaction for medical infrastructure during the transition to a NATO force) will be done in Kabul. You are not allowed to stop on the road, you are not allowed to wander/play tourist outside of the compound and you maintain your weapon inside. So, we may be winning hearts and minds here, but some people never learn. 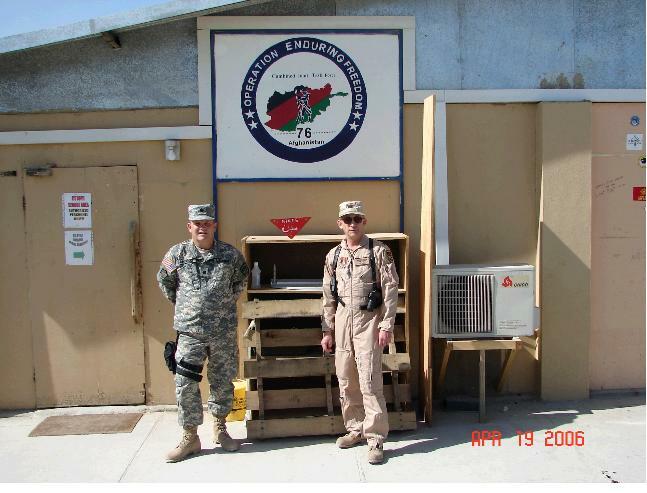 Bottom line: Being at Bagram is like Boy Scout summer camp with some adult supervision; all you can eat mess halls with most food imported (they even had steak/lobster combo on Friday nights) and everything being run by KBR-food lines, laundry, vehicle maintenance, sidewalk sweeping, internet café. Most of what I am to do has yet to be defined. Most of what I am doing now is the meet and greet of anyone vaguely connected to my mission: to save lives and stamp out disease in Afghanistan (or ensure that NATO will do so when we turn over the mission to them in 18 months). More to follow-let me know if you want off of this mailing list. I probably will try to send something out 1x week. As for military action, Operation Mountain Lion is on going down by Kandahar and will continue to do so for the future, but no action here.